I am so excited to be finished this quilt top! You can see more pictures of it in this post. There are about 1,340 hexies in this top, made out of many, many different fabrics. It was a lot of fun to pick those fabrics and plan out each of the 56 flowers. Can you imagine me spending hours and hours, cutting and sewing those 1,340 hexies, using only one fabric? What a complete waste of time that would be! 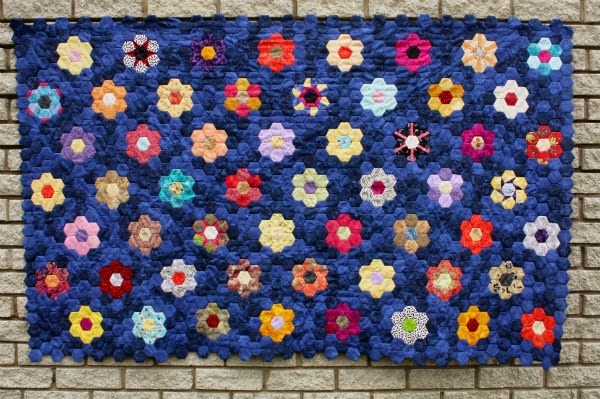 The flowers are only interesting because they are each made of two, or more, different fabrics. Even the background I chose is made of two different blue fabrics. Amazingly, God has designed His church to be like this quilt top. Before His death, Jesus prayed for all of the people who would ever believe in Him. He prayed, "That all of them may be one, Father...May they be brought to complete unity to let the world know that you sent me and have loved them even as you have loved me" (John 17:21a-23). That verse staggers me. All the people in this world who don't know that Jesus was sent by God, and who don't know about the love God has for them - they're depending on us to function in unity to show them? That seems like a tough task. Fortunately, being brought to complete unity doesn't mean we all become identical. Though my hexagons share a size and shape, they aren't identical in colour. Even so, when sewn together, they create one complete unit. Jesus doesn't want to erase our personalities, or pretend our differences don't exist. God gave us all distinct personalities and abilities so we can serve Him, each in our own way. Just as fabrics can be one solid colour, or bright florals, or batik, or civil war reproduction, or any of a number of other categories, people can be introverts or extroverts, boisterous or quiet, crafty or not. Though our goal as Christians is to become Christ-like, that refers to our character, not our individuality. So, while we should all exhibit "love, joy, peace, patience, kindness, goodness, faithfulness, gentleness and self-control" (Galatians 5:22,23), it's okay if you don't like listening to Mercy Me as much as I do. Unity comes as we accept one another's differences and focus on using who we are and what we can do to serve the church and one another. Unfortunately, it isn't always easy to accept differences. The church has an awful history of dis-unity rather than unity. Denominations have disagreed for centuries, sometimes with violent and bloody consequences. On an individual level, believers have disagreed about everything from music styles to what time services should start. When the world hears all that arguing, it's hard for them to hear the truth about the love of God. After all, Jesus said, "A new command I give you: Love one another. As I have loved you, so you must love one another. By this all men will know you are my disciples, if you love one another" (John 13:34,34). When we show love for one another, we show ourselves to be disciples of Jesus, and we show the world our unity. Our unity then shows the world the love of God. So, how should we show love to others? Paul instructs us to "Be devoted to one another in brotherly love. Honor one another above yourselves" (Romans 12:10). Maybe you don't like the music the youth in your church prefer, but you go to the youth emphasis service anyway to honour the youth and their desire to serve God in their own way. It doesn't mean you have to start listening to their music, but it does mean you don't put them down for preferring a style different from your own. Paul also wrote, "Do nothing out of selfish ambition or vain conceit, but in humility consider others better than yourselves. Each of you should look not only to your own interests, but also to the interests of others" (Philippians 2:3,4). Put bluntly, he's saying 'don't insist on getting your own way all the time. Don't always arrange things so you get the main benefit. Don't kick up a fuss if things aren't done exactly how you would like. Think about what would be good for the other person in any situation.' None of which is easy to do, of course. But when we get it right, when we let other people serve God according to their personalities, while serving Him according to our own personality, then the church functions in unity. Then the people around us can see the love of God. So then, here is my quilty definition of complete unity in the church: Many, many people, all of us sharing a Christ-like character (the hexagon shape) while maintaining our individual personalities (the different colours and patterns of the fabric) joined together to create His church (the quilt top). Wow! So many hexagons, I'm just a few hundred hexagons into my quilt top, I can't imagine what it will feel like to have it finished! Such an accomplishment. I like the variety in your flowers, and the background fabric, it makes everything more interesting.